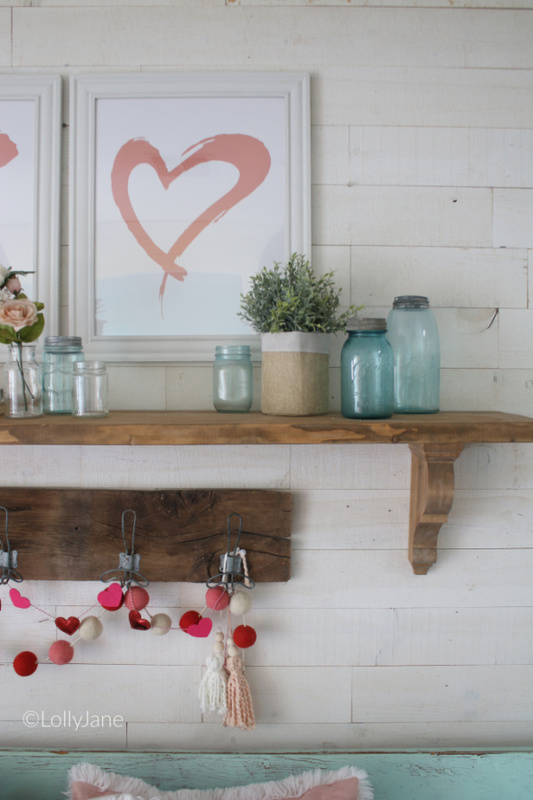 Bring some love into your Entryway for Valentine’s Day using inspiration from this mantel and shelf decorations. I look forward to Valentine’s Day every year because of my sweet dad. Every year as a little girl and until I was out of the home, he would leave a small Valentine for each of his five daughters before he left for work. And that first year in college, I missed waking up to my 5 little chocolates. But when I checked my mail, guess what was waiting for me? Every year since, I get my special box of chocolates. Because I love Valentine’s Day, I love decorating for it too! (It helps that I adore the color pink!) 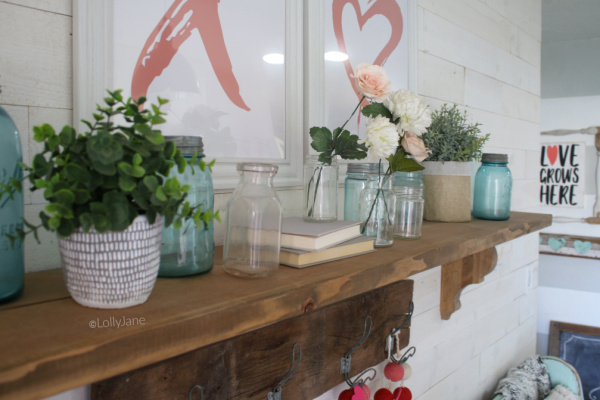 This year’s Valentines Day mantel was super fun using our own creation of our XO printables! I’ll probably recycle them into a different room in the house so they’ll get dual decorating use! 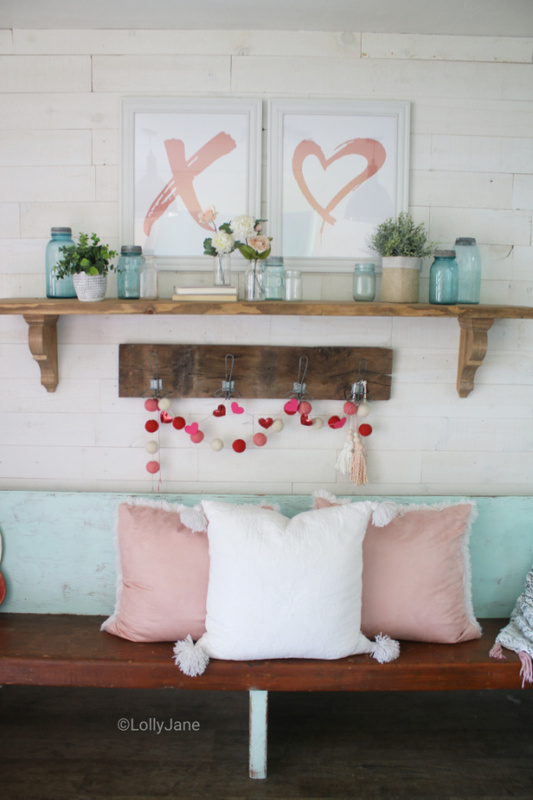 What do you think of my Valentine’s Day entryway? 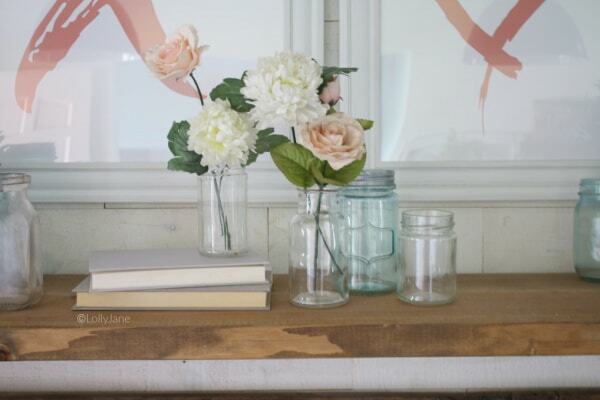 I didn’t purchase anything new to decorate my Valentine’s Day mantel this year. I love to borrow from around the house, instead. 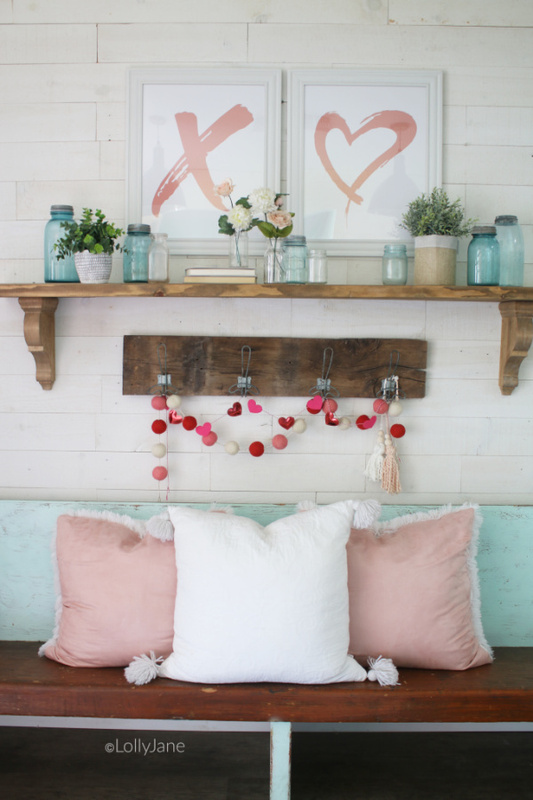 This year, I grabbed the pink pillows from my oldest daughter’s room to style my thrifted pew. I also paired it with this cute white one, I love the tassels and the fur lining together. 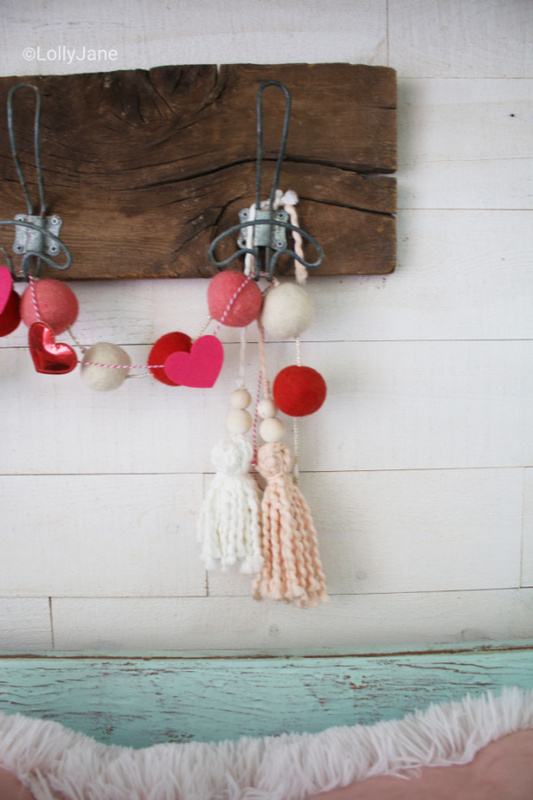 I also used the DIY wood bead tassels from Christmas and hung them at the end of the store bought garland to create a fun little mix of textures. 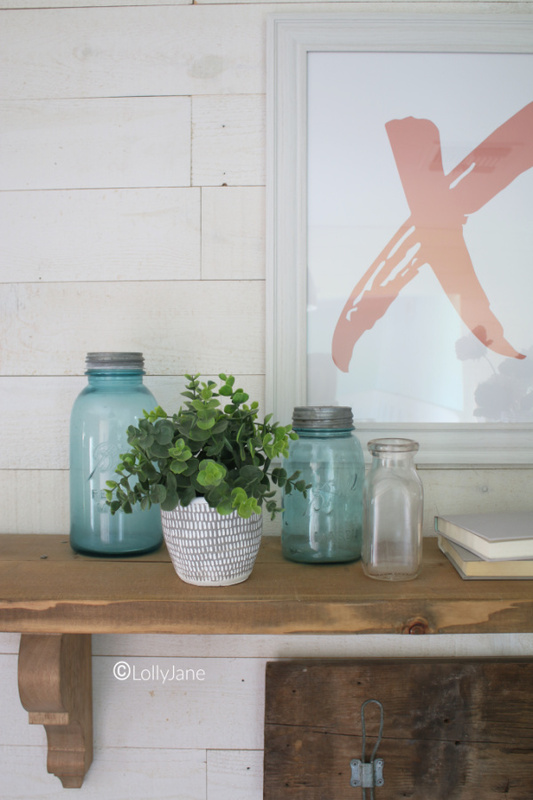 I love jars and adore the color aqua. Because I have a million of each, I simply dug through the top shelf stash of my old craft room to find the perfect amount then placed fake flowers in them. 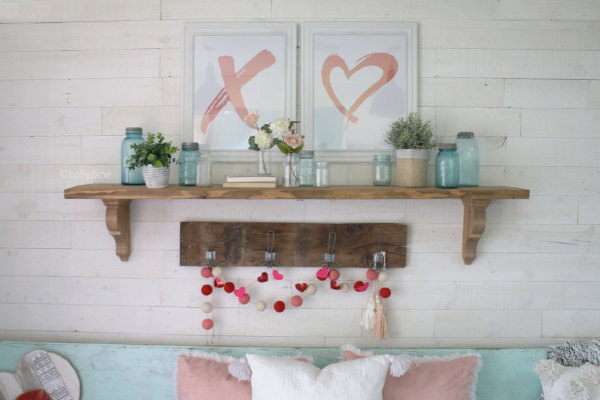 Easy Valentines Day decor! 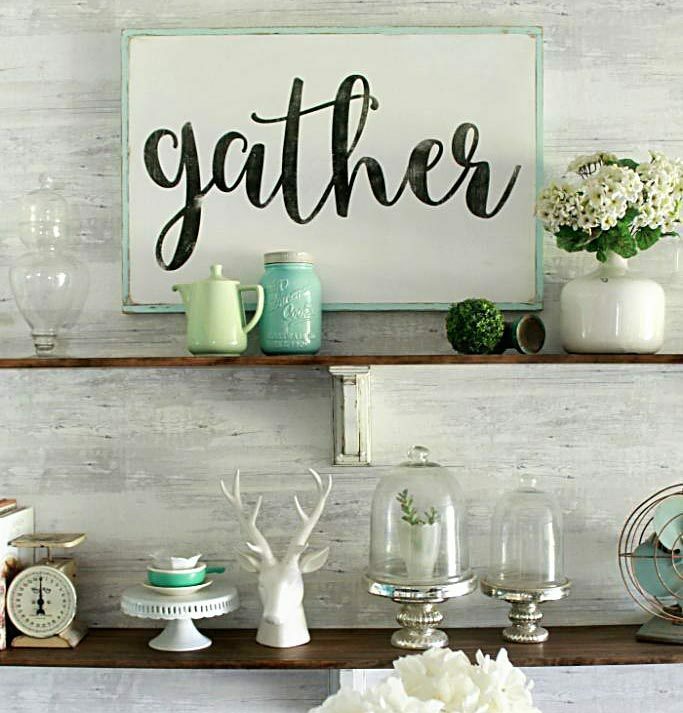 Add in some greenery and you’ve got a mantel! Click the names of the items to take you to the direct sources 🙂 Please note some may be affiliate links which means we may make a few pennies off your purchase, it’s NO added cost to you! 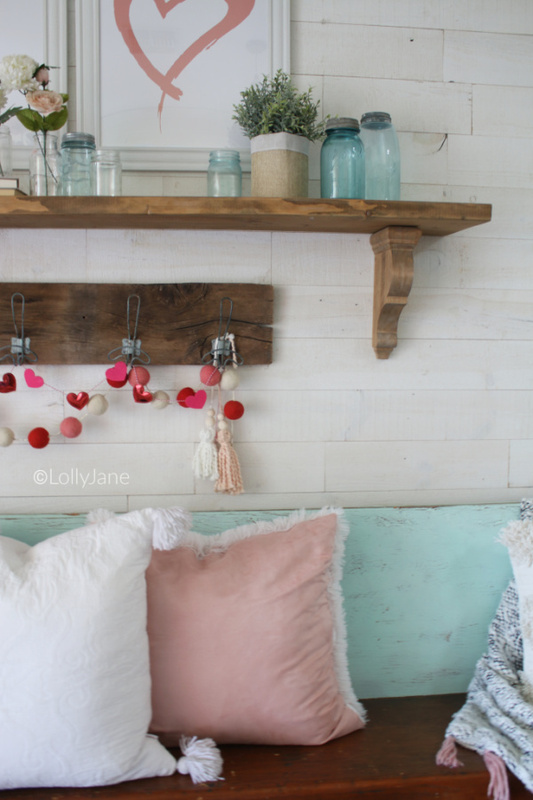 Thank you for supporting Lolly Jane and its free tutorials and ideas! You girls are so creative. I love visiting your blog. Ideas are realistic and affordable. Here in rural AZ its fun to get ideas and actually find materials in the valley or closest retail store.